The Student Campus Council (SCC) of the North-West University’s (NWU’s) campus in Mahikeng organised a human rights seminar on 21 March 2018 in partnership with the South African Human Rights Commission (SAHRC). The seminar, “Understanding the Significance of Human Rights in Contemporary South Africa”, was presented by the SAHRC’s commissioner, Ms Matlhodi Angelina Makwetla, and was attended by various members of the campus management, students and other university stakeholders. Ms Makwetla highlighted the opportunities and challenges the South African government has been experiencing after 1994. “It is quite poignant that we hold this seminar on a day like today; when many have lost their lives in the fight for justice, equality and dignity,” she said. “The Bill of Rights, just like the Constitution, become meaningless if the institutions that have to advance and give effect to them are not respected and given the space to carry out their work,” added Ms Makwetla. The SAHRC is an independent national body established by Chapter 9 of the South African Constitution, and is entrusted to monitor, protect and promote the observance of human rights. Ms Makwetla was appointed as a commissioner for human rights in January 2017. She is currently a member of the Board of Trustees of the National Empowerment Fund (NEF), where she is the chairperson of the Social and Ethics Committee. She is also a member of the NEF’s Human Capacity and Remuneration Committee. Commissioner Makwetla has received various awards and recognitions, including the Shoprite/Checkers Woman of the Year Award (Media and Communication category), the Visionary Leadership Award by the Soweto branch of the BWA, and the Top Emerging SMME Empowerment Company by Impumelelo Top Companies, a recognition endorsed by the Department of Trade and Industry. 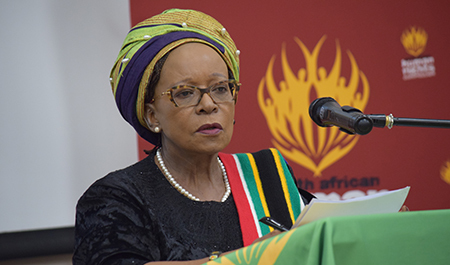 Ms Matlhodi Angelina Makwetla, the commissioner of the South African Human Rights Commission, addresses the audience during the recent human rights seminar on the NWU’s campus in Mahikeng.